Tribute poster displayed in the Lamson Paragon Factory following an Air Raid on Saturday 19th of April 1942, where those on fire duty prevented serious damage by incendiary bombs dropped during an air raid. All those present at the time are mentioned. Gledhill and Brook put their name on it, and Gents of Leicester supplied it, Parsons and Ball Manufacturing made it. Using the 'Pulsynetic' principle which swings and impulses the pendulum with a gravity arm every 30 seconds. The gravity arm is then raised and reset using a magnetic solenoid. It is different from the GPO clock Item A0073 which uses a simpler 'Hipp Toggle' principal. Removed from The Whippendell Electric Works in Watford. Gents of Leicester Slave clock supplied by Gledhill Brook for Master clock unit Item A0949, and donated by the Wemco factory in Whippendell Road Watford. Removed from The Whippendell Electric Works in Watford. Driven by a long case clock Item A0949, and used to ring bells for tea breaks, clocking on and off times Etc. In use during the second World War, and was installed long before that. It would appear that although Blick became the main user of National Time Recorders, NTR continued to supply recorders under their own name , an instruction book (not in the museum's possession) which gives Cray Avenue, St Mary Cray, Kent, as the Factory and head office address and shows that the company at that time had branch offices and local service departments in London, Birmingham, Bristol, Dublin, Glasgow, Leeds, Manchester, Newcastle and Sheffield. The booklet is unfortunately undated but the telephone number for the London office was 01-928 6641. This is an example of a time clock used for employees to log starting and finishing times. Inside one of the card slots was a punch card dated 10 Nov 1943, a lady whose name is creased out, was five to six minutes late every morning, 15 minutes would have been docked from her pay every day that she was late. Night Watchmen had to carry this clock to prove they had carried out their tour correctly and at the correct times. Fitted with two Edison Type BS 1.5 volt batteries. The National Grid was introduced in 1926. Power Stations such as Battersea, built in 1933, were to supply a grid of constant power to the entire nation. However building the plants and installing the power lines took nearly ten years. Some homes up to the Second World War were still using gas or limited electricity from local private companies, some supplying Direct Current of 110 volts. Early wireless's would be battery only, and DC was more convenient. 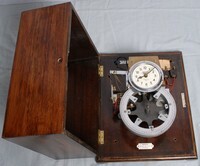 This equipment was driven by an escapement which was wound up by the supply electrically, this drove the dials, their movement was controlled by two pendulums moving over the coils carrying the supply current, the more current drawn the faster the pendulums would swing, in a circular movement above the coils, this in turn moved the dials . No current at all, no movement.